Are You A Developer With A Tree Problem? If there are trees on the land that you want to develop, Apex Environmental can help you. With the information contained in our BS5837 tree reports, you can maximise the development potential of your land. If you are uncertain of the impact that nearby tree growth could have on your property or surrounding area, a tree report can allow you to plan with confidence. What Is A BS5837 Tree Report? BS5837 tree reports come into play when planning applications could be complicated by the presence of trees. If you are planning to build, extend or modify a property or a plot which includes trees or is adjacent to trees, you will probably require a survey and BS5837 tree report. These reports are available to home owners and developers and are important to protect property, trees and wildlife from the repercussions of future tree growth. Because of the level of knowledge required to prepare a BS5837 tree report, they must be carried out by a qualified Arboricultural Consultant. At Apex we offer services relating to some or all of these five stages, depending on your needs. 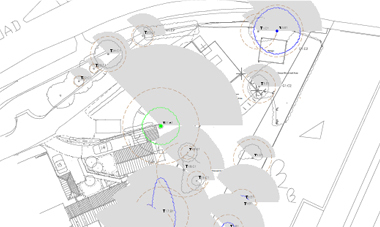 All of the plans included in these reports are produced on the latest version of AutoCAD. Would you like to learn more about how we can help you? Read the example in our portfolio of recent work of when we carried out a BS5837 report for a property developer in Birmingham. Get in touch with Apex Environmental today to find out how we can help you with a BS5837:2012 tree report.